Omegalux® MBH series mica insulated band heaters are available in one or two piece construction and a variety of diameters and widths. One piece band heaters are manufactured with inside diameters from 1 to 31/2 inches. Two piece band heaters are available in diameters from 4 to 111/2 inches. Electrical connections are made through post terminals or insulated and stainless steel overbraided leads. Each half of the two piece band heaters are rated 120 Volts, and are wired in parallel for 120 Volt operation, or in series for 240 Volt operation. Available options include different dimensions and terminals, special wattage or voltage ratings, flexible conduit and holes or cutouts. 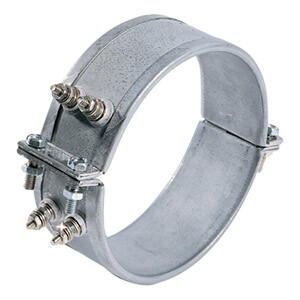 Two, or more sections can be manufactured to fit larger diameters. Contact Engineering for more information. When heating objects to higher temperatures, lower Watt density heaters should be used to prevent overheating and shortened heater life. Watt density is the total wattage of the heater divided by the heated surface area of the heater. Use the table above to select the maximum recommended Watt density for the application. Lower Watt densities can be achieved by operating 240 Volt heaters on 120 Volts. When operating 240 Volt heaters on 120 Volts, the wattage and Watt density are derated by a factor of 4. For example, model number MBH-1715300A/240 is a 1.75 inch I.D. one piece band heater, rated for 300 Watts and 36 Watts per square inch at 240 Volts. When operating this same heater on 120 Volts, the wattage and Watt density are reduced to 75 Watts and 9 Watts per square inch.